Centuries prior to the occupation by Spain, Filipinos already had their own epics, cultural traditions, folklore, and mythologies. Stories of epics, done in poetry displayed tremendous vitality, color and imagination. Tales of love and adventure about native heroes, endowed with powers from the gods, battled monsters, and triumphed over formidable armies, rode the wind, traveled in flying shields and protected the earliest communities of the islands. Stories about folk heroes of long ago were described as "Old Time History" because they can be used to study the lifestyle and beliefs of the people who produced them. They were also referred to as "Lost", because they were soon forgotten by natives influenced heavily by Spanish and "western" colonization. The Bagobo tribe has an epic hero named Tuwaang. He was a brave and strong warrior with various powers. In one story, he rode a lightning bolt to the land of Pinanggayungan and later, met the maiden of the Buhong Sky who was running away from the young man of Pangumanon: A giant with great vigor. Tuwaang and the giant fought but it was an even match. So the giant used his magical powers and threw a flaming bar at the hero. Entwining itself at Tuwaang, our hero escaped this ordeal and used his own magical ability to call the wind to fan the flames and let the giant be engulfed by the flames. From the Bicol province comes the Ibalon. The Ibalon relates the mystical origins of the first man and the first woman of Aslon and Ibalon, which are current provinces of Camarines, Albay, Sorsogon, Catanduanes and Masbate. Hiandong, one of the heroes of Ibalon was a great leader of warriors. He fought against a giant Cyclops for ten months, defeated the winged Tiburon and the fierce Sarimao and won over the seductive serpent Oriol before starting a village. His village prospered and soon, others invented the plough, harrow and other farming implements. Events in this epic also had a flood story similar to that of the Biblical Genesis. The Hud-Hud is about the life and heroism of the native Ifugao. 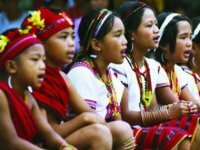 The most prominent and well admired native Ifugao is Aliguyon of the Gohandan tribe. Aliguyon possessed strange power and strength. He had the ability to travel to far away places without the need to rest, eat or sleep. He could also arrive in a place, after a long journey without feeling tired. Aliguyon had never been beaten in any fight or battle. He could catch and face any weapon from the air, and he could defeat his avenging foes. In the beginning, Aliguyon only wanted to kill the enemies of his father. But after learning that his father didn't have enemies, Aliguyon was advised by his father to just use his strength and power to win a female rightful to become his wife and companion in life. One extraordinary event in Aliguyon's life was his duel against Pumbakhayon, a warrior who had the same fighting strength and skills as Aliguyon. Pumbakhayon was from a nearby tribe called Daligdigan. Aliguyon and Pumbakhayon had a duel that lasted a year and a half. After a brief intermission, the two resumed their fight which lasted for another year and a half. Eventually, both men realized that they will not be able to beat each other. Therefore, they made a simple arrangement. Aliguyon agreed to marry Bugan, a sister of Pumbakhayon. While Pumbakhayon married Aginaya, a sister of Aliguyon. The arrangement unified the tribes of Gohandan and Daligdigan. Here ended the story of the Hud-Hud epic. For the first time, the father of Ilocano poetry named Pedro Bukaneg put down one of the Philippine epics in writing around 1640. The hero, Lam-Ang could talk immediately after birth. He picked his own name, chose his own sponsor and asked for his father’s presence. Barely 9 months old, Lam-Ang fought against the headhunters who killed his father. He was also eaten by a sea monster, but was reborn from his retrieved bones. He also journeyed to get the beautiful Ines Kannoyan accompanied by his pets; a rooster and a dog. Ines Kannoyan’s place was filled with suitors, Lam-Ang’s rooster flap it’s wings and the long house toppled. This amazed every body, especially Ines. Then, Lam-Ang’s dog barks and the long house rose to it’s former. Lam-Ang gave Ines two golden ships filled with treasures, and then he married her from noah. The people of Mindanao had rich literature that existed only in their minds and memories. Only recently were these Philippine epics put in writing, so these can be studied by the public. Locally called "Darangan", these epic poems were similar to those of Homer’s Iliad and Odyssey. The Darangan tells of the sentimental and romantic adventures of noble warriors, one of them, is about a warrior-prince called Bantugan. Prince Bantugan was the brother of the chieftain of a village called Bumbaran. Bantugan owned a magic shield, was protected by divine spirits called "Tonongs" and was capable of rising from the dead. Once his enemies attacked Bembaran, thinking he was dead. In the nick of time, Bantugan’s soul was recovered and he saved the village. There is also an episode, where Prince Bantugan was on a quest and fought his enemies with his magic Kampilan (Native sword). Soon, he got tired and fell on to the water. A crocodile delivered him to his enemies, but he regained his strength, escaped his captors, commanded an oar-less ship and won the battle. There were also “Darangan epic poems that relate stories of wars about abducted princesses. Just like the chronicles of the Trojan War. The Darangan is one of the oldest and longest Philippine epics. Several nights were needed to recite the twenty five beautiful chapters. The Darangan, sung in it’s original, possessed a sustained beauty and dignity, it might be studied for it’s aesthetic values alone. The Maragtas Chronicles of Panay is a history of rulers of the island from the time of the Ten Malay Datus (rulers) that settled from Borneo. The "Legend of the Ten Datus (chieftains)" narrates about the forefathers of the Filipinos and the story of ten Bornean chieftains who escaped the cruel regime of Sultan Makatunaw. Datu Puti along with other nine chieftains plans to leave Borneo. Riding their native boats, they ventured into the night and across the wide ocean. At first, the ten rulers and their families were afraid that they might perish in the middle of the sea. Soon, they reached the islands of Panay and befriended the natives called Aetas. The Aetas are quite friendly and decides to sell a piece of their land to the ten chieftains. The chieftains gave the Aetas leader, Marikudo a golden Salakot (Native head piece) After this; the chieftains and Aetas lived in peace and harmony. The Haraya is another of the Philippine epics from Panay. It is a collection of rules of conduct told in the form of heroic tales. The "Hari sa Bukid" of Negros is a mythical epic of Kanlaon (Kan comes from a Persian word "Khan" meaning "King" and "Laon" from a Malay word meaning "Ancient.") and "Hinilawod" an epic poem made by the early inhabitants of Iloilo, Aklan and Antique also from Panay. The hero of Hinilawod, “Humadapnon” was of divine ancestry. He had super natural powers and guardian spirits to protect him. His most exciting adventure was his search for Malitong Yawa Sinamagling Diwata: A beautiful maiden whom he saw in his dream. He boarded his golden boat, sailed amidst dangerous seas, and was captured by an enchantress/engkantada. Finally, he found and won the love of Malitong Yawa Sinamagling Diwata. The colorful and fascinating literature of pre-Hispanic Filipinos are still here. Giving the new generation an overview of a heritage that is an unusual and invaluable source of joy and information regarding the lifestyle, love and aspirations of early Filipinos. It is from these, wonderful Philippine epics, where a Filipino can find his or her national identity. It is from these that a Filipino can feel heroic, truly pulsating with splendor of a magnificent and authentic cultural force.